One of the things I love about these first years and months is how much I am learning. All the time. This naturally leads to an equal measure of disappointments as light bulb moments, but from it all, I'm learning. I'm learning both how to use my camera and how to process the pictures I make. My style has changed since I first picked up my camera, sometimes subtly, sometimes less so. I love the potential of an image straight out of my camera. I love that sometimes, I don't know what it's meant to look like until I've finished. From time to time I learn something that has a big impact on how I process my pictures. 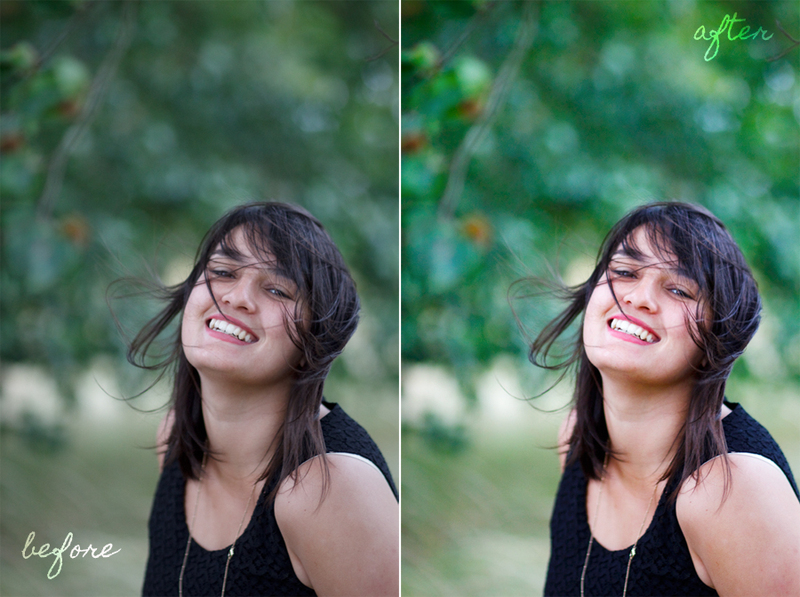 That is the reason for this blog post, for my very first before and after post! I thought I'd share with you something that I think has changed my photography for the better. I don't tend to do a lot to my pictures - I try my hardest to find good light, and to get things right in camera. I am, however, a big believer in polishing an image as it requires. There's something about the care I can take, tweaking things until it is just right. onto this image. Stacey is a colourful and lively person. I asked her for a 'Stacey smile' in this shot and I got one! She is just so full of life and I wanted this image to reflect that! Most of what I've learned about processing has just been by trying things out and a couple of months ago, I clicked on the 'soft light' layer and I loved what it did to my image. It makes my picture pop a little and brings it to life. Apart from some level adjustment and a nudge in saturation that's all I wanted for this particular picture and I think I achieved what I wanted. This is not about soft light being the answer to all my processing - it isn't. My point is, that when we continue to invest time and energy in something we do learn, and we will improve. My pictures are better than they were a couple of months ago and I'm loving the journey. Have you learned anything that's changed things for you lately?